If you are short of time, the answers to the following 3 questions should let you know all you need to about the Sonicare 5 Series HealthyWhite+. If we have missed something, let us know in the comments. If you want more detail, you can read our full HealthyWhite + review further down the page. Sonicare are one of the top toothbrush manufacturers in the USA and produce excellent brushes. The HealthyWhite+ (also known as the 5 series) is no exception. It delivers a fantastic clean, it is well built and has a superb battery life. I could quite happily use this as my everyday toothbrush. With so much choice available today, it is the ProtectiveClean 6100 that wins out in our opinion as the best alternative. A newer model, it benefits from some innovative touches such as a brush head replacement reminder system, which are very practical on a day to day basis. The DiamondClean Smart is also an option, but you pay quite a bit more, but this is the best electric toothbrush on offer today. You may also like to check out our choice for the best overall toothbrush. 3. Where is the best place to buy the Sonicare HealthyWhite+? If you think this is the electric toothbrush for you, then you can buy this direct from the Philips online webstore, or you can get it from Target, Walgreens, BestBuy, Walmart and Amazon to name just a few. Philips of course sell this at the recommended retail price, but many of the other retailers are selling it for $10-30 less than retail, meaning it is well worth shopping around and finding the retailer with the best price when you come to purchase. Our recommendation is to buy from Amazon as more often than not their price is the best out there and their service is excellent too and very regularly there are additional coupons that allow for even further savings. Quality and performance is what you get with this electric toothbrush. This is far from the basic brush, but is not as feature rich as the DiamondClean and DiamondClean Smart models available from the brand. The result is a fairly decent box contents and features at a more acceptable price. The naming convention does make it quite complicated to get your head around what this brush is and where it sits in the Sonicare range, particularly as there are a few different versions of what are essentially the same brush. The first thing to know is that this model is most commonly referred to as the Sonicare HealthyWhite+. There is the HealthyWhite (non + model) too, but this is a completely different toothbrush. You may also see this brush referred to as the 5 Series or Series 5 as this falls in line with Sonicares additional naming/portfolio structure. Sonicare HealthyWhite+ HX8911/02 – This is a White & Green colour combination that comes with a charger, travel case and DiamondClean brush head included in the box. Sonicare HealthyWhite + HX8911/99 – This is a White & Iridescent colour combination that comes with a charger, travel case and DiamondClean brush head included in the box. Sonicare HealthyWhite + HX8918/10 – This is a White & Green colour combination that comes with a charger, travel case, DiamondClean brush head, Tongue Clean + brush head, 2Oz antibacterial spray and brush head stand in the box. You will see that the first 2 models are the same with the exception of the colour of the handle. The third is the same as the first with extra items included in the box. The brush we are showing/reviewing in this review is the more commonly found HealthyWhite+ HX8911/02. Here are what I consider to be the main plus and minus points for the Sonicare HealthyWhite+. Cleaning – Offering up 2 cleaning modes the brush is very effective at removing plaque and delivering a fantastic fresh feeling to the mouth. Intensity Levels – Change between 3 different power settings to find the one that is most comfortable for you as you brush your teeth and gums. Perfect if you are suffering from sensitivity. Quality – The brush feels solid, robust and well built in hand. Bluetooth connectivity – Essential it might not be, but at this price it encroaches on those that offer such and it’s becoming a more desireable feature for some users. Price – The brush is relatively expensive when you consider the alternatives, particularly when the cost of replacement brush heads are factored in. From the moment this brush hits the palm of the hand and fingertips it is apparent that is is not some cheap basic electric toothbrush. It is a tad thicker in hand than some of the Oral-B options but that is easily excused when you know that this brush delivers a battery life of 3 or more weeks. It is of plastic construction and the White body is accented with the pale minty Green colour of the intensity control button, the base plate of the brush and the symbol on the power button. Pick up the HX8911/99 and the White body is complimented by a pale Blue colour Sonicare call Iridescent. The shape of the brush handle is not quite a perfect cylinder, there is a slight squaring to it that gives a bit of strength and grip to the handle. Obvious grips like strips of rubber or raised contours to the body there are not on this handle. However, on the back of the handle and really only visible in certain lights, are a series of very lightly textured strips woven into the body. Barely noticeable, yet the most subtle change in texture as you run a finger over them, just enough to offer a little extra grip, but not affecting the aesthetics of the brush. The base of the brush is home to a centrally placed recess into which fits the prong on the charging stand. The brush stands upright when placed on a work surface and need not be laid down. At the opposite end is the metal shaft that feeds inside the brush handle. It is to this that the brush head connects and the power is delivered to the bristles. On the front of the brush handle is where there is lots going on. The Sonicare logo sits proudly in place right up towards the neck of the brush. It’s printed on in a grey font. Below this, inset in a gloss white plastic frame is the recessed power button, 3 LEDs and what looks like a volume control in green. This control is to increase or decrease the intensity level of the brush and in turn changes how many of the LED’s above it are illuminated. Towards the base of the brush, outside of the gloss white frame is a clean and white cleaning mode name, with a single LED above each. Virtually at the bottom of the brush handle is the battery status icon which lights up either Green or Yellow to indicate the condition of the battery. Full details about this and how the battery performs can be found in the battery section of this review. Both the power and power intensity key provide a reassuring level of feedback and do require a small amount of force to be activated, but are not too soft that they could be pressed too easily. The HealthyWhite has been designed to appeal to a broad audience and looks smart. Built into the brush handle is the Lithium-Ion battery and the motor as well as the other technology that controls this brush. You cannot access the internals, the battery in particular is not designed to be user removable. The handle is water resistant and will withstand exposure to water and moisture such as toothpaste and saliva. Do rinse and dry the brush off if you can after use. Do avoid total submersion within water as this could damage the brush. Quality is as I mentioned part and parcel of this brush and being a Philips product it is built to a high standard. Should something go wrong, there is a manufacturer supplied warranty that lasts for 2 years. As an extra bonus, if you register the brush online, you can extend that by a further 6 months for no extra cost. In addition to the brush handle, in the box is a brush head, charging stand and travel case, a second brush head would have given a bit more value to the box contents. The charging stand, as the name implies is used to recharge the battery. I explain this and how it works a bit more in the battery section of the review. It is a fairly solid case. It is not the most premium have seen or used and the brush cannot be charged in the case either, like the DiamondClean Smart can be. However, despite being a fairly basic case it is thicker and sturdier than those provided with many Oral-B models and is a welcome inclusion, particularly if you travel occasionally. So to actually using the brush then. Slide the provided DiamondClean brush head onto the top of the brush and you are ready to go. You have 2 cleaning modes to chose from, they are ‘Clean’ and ‘White’. We explain how these work in our post on Sonicare’s various brushing modes. The brush will remember the cleaning mode used, so if you chose the White mode, next time the brush is powered on White mode will be activated. Clean is the go to mode if you like for most people. Lasting 2 minutes it does all you need to remove plaque, bacteria and debris to leave you with a clean and fresh mouth. White lasts for 2 minutes and 30 seconds and is designed to give that dentist like clean with a focus on polishing up the teeth so they look nice and white. 2 minutes for standard cleaning and then the remaining 30 seconds focused particularly on polishing the front teeth. Do bear in mind that the longer ‘White’ mode will affect the battery life. The DiamondClean head that was included works particularly well with this White mode. Any Sonicare brush head can be used on any cleaning mode, but the DiamondClean is better suited. The brush heads are interchangeable, there are a range to chose from including different sizes. Standard is what most people go for, but there are too compact versions which can be good for children and reaching the back of the mouth, where it might be more difficult with the standard head. When the toothbrush is running in either cleaning mode you have some extra controls and features than can transform the brushing experience for you. There are the three levels of brushing intensity. You can chose what is right for you. Use the + or – buttons on the handle to change the intensity. As you press the buttons the LED’s will change on the brush handle too. Low intensity will have 1 LED lit, Medium will have 2 and High all 3. There is a noticeable difference in the power delivery to the brush head and also the sound emitted from the brush, with high being the most powerful and loudest. Even on the most intense setting the rush is still quieter than an Oral-B equivalent. Sonicare brushes tend to humm whilst Oral-B brushes have a more mechanical sound. Finding the right intensity for you is important. The more powerful you have it, the greater the potential for more plaque removal; but if you find this uncomfortable do not continue and reduce the power. You can change this intensity mid clean by simply pressing the + or – button in the centre of the brush handle. Power is one of the reasons people go for an electric toothbrush but are also put-off. New users can find it too intense. Designed specifically for first time users, it helps ease you into using such a powerful electric toothbrush. The Easy-start feature gradually increases the sonic power over the first 14 brushing sessions. The brush delivers up to 31,000 strokes per minute to the teeth and gums once out of the easy-start mode and has been shown to remove as much as 7x more plaque than a manual brush. The HealthyWhite+ does a great job of cleaning and at no point did I feel the brush had done a poor job, my teeth felt clean and refreshed after each clean. A very important feature is the built in timer/pacer. With either mode the built in pacer and timer begins working from the moment you turn the brush on. At 30 second intervals there is a slight pause in the brush head motion which changes the sound emitted from the brush and stops bristle movement, signaling to you to change quadrant of the mouth when cleaning. A pressure sensor is not really found on Sonicare brushes, but is on Oral-B. As the name implies if too much pressure is applied during cleaning a light is illuminated to alert you and you can reduce this so as not to do damage to the teeth. You soon learn, and it comes somewhat redundant. It is not an essential but would be a nice inclusion that would help new users I think. Bluetooth is another feature that is beginning to creep in at this price point and whilst it is far from required, it is another feature that makes the likes of Oral-B brushes potentially more compelling. Check out the Pro 3000 for more information on this. As far as decent battery life goes in an electric toothbrush, Sonicare are the winners here. When compared to their biggest competitor Oral-B there is really no competition. An Oral-B brush lasts some 12 days compared to over 21 days of Sonicare. The importance you place on battery life might be different, but I like the idea of going away on a trip for a week or two and not having to worry about taking a charger with me. With the HealthyWhite+ you really need not worry. Sonicare advertise a 3 week battery life from the Lithium-Ion battery built into the handle. My very own hands on testing (using ‘clean’ mode) managed to achieve 27 days from a full charged brush! That is a total of 108 minutes runtime and nearly a month without having to re-charge. This was with the intensity set to high, so it might be even greater if it’s set to low. Impressive it most certainly is, considering the overall size and weight of the brush handle. I would be happy with 2 weeks battery life, but with 3+, that certainly puts a smile on my face. This usage time is based on the brush being used by 1 person, twice a day for 2 minutes each time. If you share the brush handle, you will get the same usage time, but will need to recharge more frequently. As you would expect a charging stand is included in the box. The White plastic stand has a prong on the top, that fits into the recess on the bottom of the brush handle. It is this prong that keeps the brush upright on the stand and delivers the charge. The power cord is about a meter or so in length and connects to the power socket. It actually supports voltages from 110-220v, making it great for travelling although the power adapter on the cable is a US configuration. To fully recharge the brush will need to be left on the charging stand for up to 48 hours. You need not always fully recharge it and you can always pop it back on the charger when you are done with it. A battery status icon on the handle does indicate the condition of the battery. A flashing Yellow indicators means low charger, with a flashing Green indicating moderate charge. A solid Green indicator and the brush has a full charge. When charging it will flash Green. When you hear 5 beeps and the battery indicator is flashing Yellow, this will mean the power is too low and needs to be charged before it can be used. I mentioned at the start of the review how there are really 3 different variants of this brush. There are the two which are identically boxed, the only difference being the actual colour of the brush handle and then there is the ‘premium’ package that contains a Tongue Care+ brush head, a brush head stand and an antibacterial spray. The later commands a $10 premium over the $119.99 recommended sale price set. For the most part the brush is sold close to this recommended retail price, with the average sale being around $100 from our own research – we’ve included a live price comparison of US retailers here. The good news is that with a bit of shopping around, it can be possible to get some extra savings. Of course all prices and discounts are subject to change, but we were able to purchase it as low as $70 with a coupon code. It was available for $80 without, but most retailers sold it at around the $100 mark. Very much in proportion to the rest of the Sonicare range, this price is somewhat to be expected when you consider the models above and below the HealthyWhite+. Unless you really need the ‘White’ cleaning mode on offer here, the Sonicare 3 Series brush actually makes for a more cost effective purchase at $20 less. This price point is also right on the heels of Oral-B models. They do not perform as well in the battery department, but make up for it in box contents, cleaning modes and innovation. The Pro 3000, 5000 and 6000 are all contenders and separated by just a few dollars. Whether they are a better buy or not is difficult for me to say, but there is certainly the feeling of better value, particularly when you consider when the average brush head cost is $3 less per head. A Sonicare head comes in on average at $8. Over 3 years, that is that is $33 saving just on brush heads if you opted for an Oral-B brush instead. At Electric Teeth, we like to price the models over a 3 year period to get a rough idea of what the total ownership cost is and how they compare to other brushes on the market. Take the average $100 purchase price, add the cost of replacement brush heads for 3 years ($88) and the total ownership cost comes out at $188 or $0.18 cents per day. Manage to get a deal on the brush at $70 and it comes down to $166 or $0.15 per day. For the sake of comparison, the Oral-B Pro 5000 has 5 cleaning modes, Bluetooth a travel case, a brush head storage compartment and pressure sensor. It costs $155 or just $0.14 per day to own. With any brush you can extend the value by sharing the brush handle with another user. Of course change the brush head and be aware that you will need to recharge more frequently, but this can help keep the cost of ownership down. When you are looking to spend your hard earned money on something you generally want to get value from that item. I have always personally held Philips products in high regard, be that toothbrushes, lights or other household products. Even Sonicare’s cheapest electric toothbrushes have a level of quality that appears to surpass the competition. The HealthyWhite is solid in hand and feels good. Plastic the construction is, but cheap and flimsy are not words you would really associate with here. As best as possible with our hands on here at Electric Teeth we really test them, look for failings and possible weaknesses long term. Can we find any here? No, there is nothing to cause any concern. Of course by the very nature of the product there is always a chance it could fail, but the standards set by Philips aim to reduce this. Should something go awry then you can fall back on the 2 year/24 month warranty that they offer. You can actually extend this by a further 6 months if you register the brush on Sonicare’s website after purchase. There is no cost for this. This brush far exceeds what the vast majority need or desire of an electric toothbrush, but manages also to answer to those who want something a little bit extra. The clean provided by the brush is superb, it is difficult to fault, especially when you have control over just how much power the brush actually delivers, which is particularly appealing if you have sensitivity or do not like the extra power that electric toothbrushes often deliver. Small, but incredibly powerful features built into this brush are the auto-power-off and the Easy-start mode. In the scheme of things, these they are small, but it is often the small things that transform how we perceive and interact with a toothbrush. The travel case is a smart in box accessory that is often overlooked. As solid and desirable as this brush is, you cannot ignore the competition that exists at this price. Whether the alternatives are better or not is personal opinion. We particularly like the ProtectiveClean 6100. When Bluetooth connectivity, a pressure sensor and extras in the box begin to come into play, they make for compelling choices, even if the sacrifice is battery life. The HealthyWhite+ is certainly priced in line with other Sonicare models and lives up to the premium brand expectations that many of us have. How many brushing modes does the Sonicare HealthyWhite+ HX8911/02 have? This brush offers 2 different cleaning modes, Clean and White. Press the power button to switch the brush on, then again to be taken to the next cleaning mode available. Yes, it does. The warranty is 2 years, register it online and you can extend it for a further 6 months at no extra cost. Officially the the battery lasts up to 84 minutes, which is equivalent to 3 weeks or 21 days of usage based on 2 x 2 minute cleans per day. However, our hands on testing achieve an impressive 108 minutes or what is equivalent to 27 days usage. Can I use the Sonicare HealthyWhite+ in the shower? 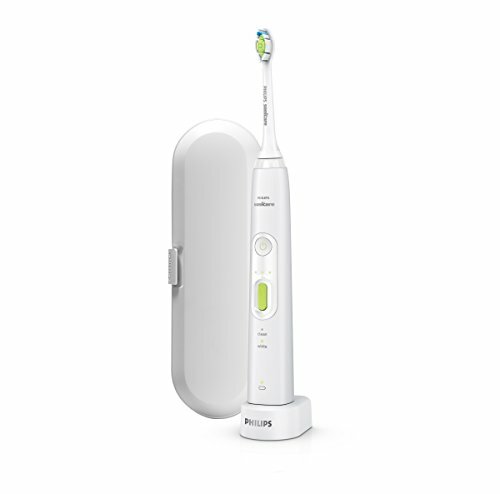 Do you own or have you used the Philips Sonicare HealthyWhite+ HX8911/02?